Orders of $50.00 or more qualify for free shipping. Only orders placed within the contiguous 48 US states qualify for free shipping. We cannot ship to P.O. boxes, APOs, FPOs or any U.S. territory. We reserve the right to choose the shipping method based on cost. Typical delivery time for orders that qualify for free shipping is 3 to 8 business days. We do not ship to P.O. boxes, APOs, FPOs or any U.S. territory. Online stores, USPS and FedEx shall not be liable for any interruption of service due to causes beyond its control, including, but not limited to, the following: the unavailability or refusal of a person to accept delivery of the shipment; acts of God; acts of public authorities acting with actual or apparent authority; acts or omissions of customs or similar authorities; insufficient information provided by a customer; the application of security regulations imposed by the government, or otherwise applicable to the shipment; riots, strikes or other labor disputes; civil unrest; disruptions in air or ground transportation networks and natural disasters. Economy shipping takes 3-8 business days and is not guaranteed. Most orders that ship ground usually ship the same business day if placed before 2:00PM EST and the items are in stock. Orders that ship economy will ship within two business days if placed before 2:00PM EST and the items are in stock. Expedited Shipping Information: Deadline for orders requiring Next Day, 2 Day, or 3 Day delivery is 2:00 PM EST (Eastern Standard Time) for items in stock. Expedited orders placed after 2:00 PM will ship by the end of the next business day for items in stock. Next Day, 2 Day, or 3 Day orders placed on a Friday after 2:00 PM EST will ship the following Monday. Please note that certain items are shipped directly to our customers from our manufactures across the United States. For these items, please allow 5-10 business days for delivery. We strive to ship within two business days. Sometimes a delay will occur. Some items list alternate shipping times on their specific web pages. Expedited orders will be notified of any delays. FedEx does not deliver on the weekends unless you order special Saturday delivery at extra cost. Please contact us to arrange this. 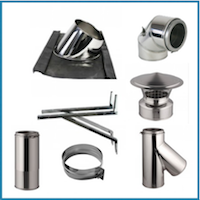 At Chimney CC, we believe in only selling products we would be proud to use in our own homes and want you to buy with confidence. While many companies claim that their goal is 100% customer satisfaction, we really mean it. If you are not 100% satisfied with your purchase you may return your new, unused purchase for an exchange or refund within 30 days after the date you receive your merchandise. The only fee that you will be responsible for is the return shipping. The product must be in new, unused condition meaning it must be returned in the original packaging. 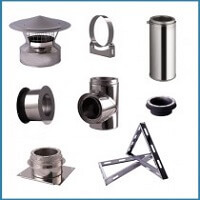 Products that are custom ordered like custom chimney caps, custom screens and other customized or made-to-order products are not eligible for return unless specifically noted on the product. When you return products that were shipped to you for free (products over $50 or other free shipping offers) you get a full refund minus the original outbound shipping costs. Orders not eligible for free shipping will receive a refund for the amount of the returned product only. Products that are Special Order items are noted as such and cannot be returned. Used consumer products like gel fuel and creosote remover cannot be returned. Kits can be exchanged or returned only as a whole. Damaged merchandise includes items that have been damaged in route. If a shipment arrives at your door with obvious shipping damage, please refuse the delivery. If you have already accepted delivery and then find shipping damage, please call our customer service line immediately. Save all packaging material and paperwork. If you attempt to return the merchandise without speaking to our representative, you will jeopardize your chances of making a claim, and you may not receive credit for the return. Note: Products that have been misused, abused or neglected are not eligible for return. For example, if you run over your fireplace tool set with your car, you can’t return it. If you put a hole in your fireplace screen…you can’t return it. As soon as you return your item to us and it's received into our system, we will expeditiously send a refund request to your bank. Please note that while the funds are instantly deducted from our account, some banks may take 5-7 business days to process and post these refunds to your account.